04:05: Dexter driving fast in Miami traffic. 04:31: Dexter stops at gas station (card declined). 05:41: Travis Marshall's Church (caught by Deb). 11:33: Harry's House. (Morgan family home). 12:34: Gas Station. (Debra filling gas can). 13:27: [Establishing shot] Coastal skyline. This Miami shot is looking west across the bay to the freight elevators of Dodge Island, with the Miami downtown skyline in the background. It appears to have been shot from the far southern tip of Miami Beach, probably from South Pointe Park. 14:02: Travis Marshall's Church (cops & fire department arrives after fire). 21:17: Mike Anderson shot. (after stopping to help motorist on the road). 25:29: Harry's House. (Morgan family home). 27:08: Mike Anderson's murder scene. 36:16: Dexter driving fast in Miami. 36:21: Viktor Baskov's Apartment Tower. (exterior). 42:45: [Establishing shot] Bar exterior. 42:49: Angel & Quinn's bar. 44:23: Kill room in Miami Airport baggage room. 46:15: Isaak's mansion (in Kiev, Ukraine). 49:05: Harry's House. (Morgan family home). 03:51: Front Lawn of Dexter's Apartment. 14:31: Dexter & Debra walk & talk on a dock. 47:41: Dexter meeting with Debra at night. 04:17: Miami Metro exterior (then interior). 06:28: Narrow alley/walkway outside of Police Station. 18:52: Louis's penthouse apartment. (interior only / studio set). 30:49: Hannah's house & her "Hannah-Flora Nursery". 07:00: Narrow alley/walkway outside of Police Station. 17:10: Police Station parking lot. and downtown Miami skyline in the background. 37:13: Brick rooftop chase scene (above Speltzer's death maze). 39:08: Viktor Baskov's Apartment Tower. 40:49: Funeral (of barmaid Speltzer killed at his house). 03:09: Dexter on his boat at the marina. 13:33: Schooner or Later restaurant. 26:04: Searching for bodies on beach. 28:14: Phillip Barnes' house. (Debra & LaGuerta). 08:32: Establishing shot: Heading west on Venetian Causeway, leaving Rivo Alto Island, in Miami. 08:44: Hannah's house / nursery. 15:34: Police Station parking lot. 35:09: Hannah's house / nursery. 46:19: Establishing shot: Edgewater South Beach condos at 1410 Ocean Drive, in Miami Beach. 46:21: Debra & Sal Price at restaurant. 08:28: Establishing shot: 1400 block of Brickell Bay Drive, in Miami. 08:31: Hannah's house / nursery. 25:28: Hannah's house / nursery. 29:38: Sidewalk Cafe: Debra meeting Sal Price. 17:09: Hannah's house / nursery. 19:28: Quinn drops off Nadia outside the Fox Hole. 20:20: Dexter stalking Isaak (outside a restaurant). 20:41: Jamie driving in car with the kids (on phone). 21:22: Viktor Baskov's Apartment Tower. (exterior). 22:52: Coral Cove Marina: Dexter's former boat dock. 47:28: Dexter driving at night with Harry. 03:34: Dexter & Hannah on his boat, the Slice of Life. 10:01: Crime scene: Dead body in burned-out car. 22:35: LaGuerta meets Matthews at his boat (the Ocean Master). 26:32: Dexter meets Debra in parking lot of Queen's Wharf restaurant. 34:50: Crime scene: Burned corpse in elevator. 38:38: Cargo ship, the Fearless, at port. 41:24: Police Station parking lot. 41:27: Cargo ship, the Fearless, at port. 45:46: Cargo ship, the Fearless, at port. 47:49: Debra at Jurg's place (exterior). 10:20: Establishing shot: Heading south on 1400 block of Brickell Bay Drive, in Miami. 14:51: Park / Civil War reenactment. 16:30: Establishing shot: 700 block of Ocean Drive, in Miami Beach, FL. 18:18: Establishing shot: Looking west toward Wind condo, at 350 S. Miami Ave, in downtown Miami. 21:40: Crime scene: Burned bus. 25:44: Establishing shot: 1550 Collins Ave, Miami Beach, FL. 26:51: Establishing shot: Miami marina. 33:32: Establishing shot: Historic City Hall, 1130 Washington Avenue, Miami Beach. 35:53: Site of cabin where Doakes died. 44:18: The Phantom Arsonist's house. 13:37: Dexter takes Harrison to visit Santa. 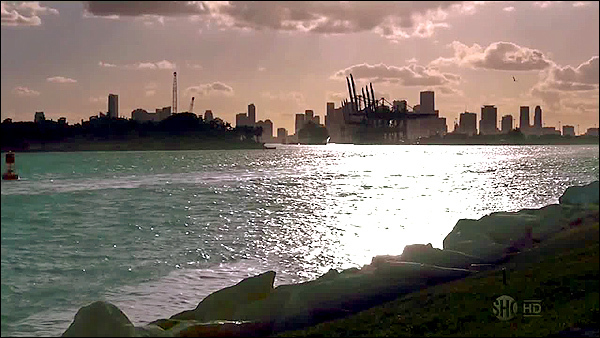 26:59: Establishing Shot: Miami, as seen from west side of Watson Island. 27:02: Dexter with Matthews at his docked boat. 28:50: Dexter meets Estrada at dockside bar. 36:06: Debra's Auto Repair Garage. 47:46: Dexter meets Estrada at container yard (kill room). 08:43: Arlene gets a call from Hannah. 23:13: Flashback with Doakes & Dexter at murder scene on the docks. 36:38: Dexter & Debra talking in car. 43:47: Container yard / Kill Room. 46:27: New Year's Eve Party at Angel's Restaurant. 49:00: Hannah at Dexter's Apartment. 49:19: Container yard / Kill Room. 53:50: New Year's Eve Party at Angel's Restaurant.